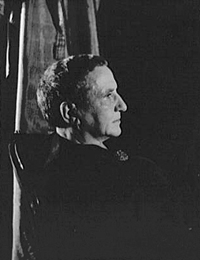 Gertrude Stein, an American-born expatriate in France, was a prolific and accomplished author whose unique literary style exerted a profound influence in twentieth-century literature. Stein and her life companion Alice B. Toklas hosted an eccentric salon at their home in Paris, entertaining and inspiring European artist friends Pablo Picasso, Henri Matisse, and Georges Braque, as well as fellow American expatriate authors Sherwood Anderson and Ernest Hemingway. Stein was the first collector to support Cubist painting and her own work is informed by the movement’s theories. Her books include Three Lives (1909), The Making of Americans (1925), The Autobiography of Alice B. Toklas (1933), and Brewsie and Willie (1946). Carl Van Vechten. Portrait of Gertrude Stein, 1934. Library of Congress, Prints and Photographs Division, Washington, D.C.